It’s a common, ornamental succulent used in drought tolerant gardens all over Southern California. It’s a beautiful, hearty plant that grows well in a variety of soils. It’s called “Sticks on Fire”. 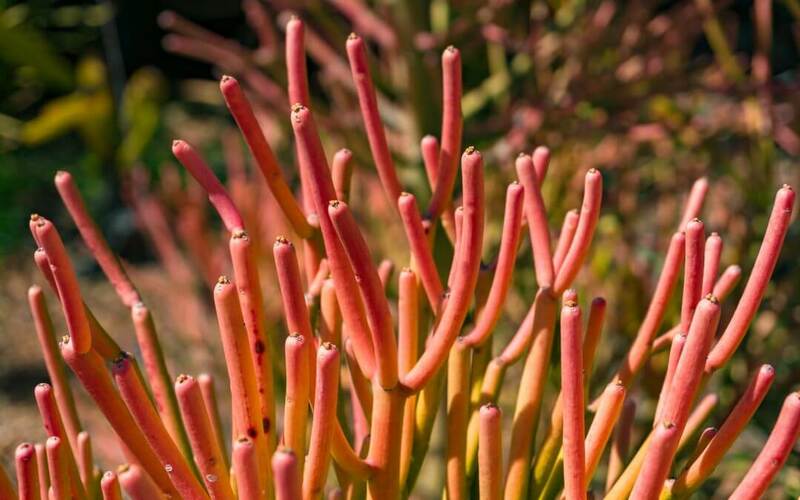 The “Sticks on Fire” plant, known as Euphorbia tirucalli, is a member of the genus Euphorbiaceae. There are over 1600 species of this family worldwide. The “Sticks on Fire”, is toxic to humans and dogs. It contains a milky sap capable of causing serious gastrointestinal, eye, and skin irritation. Of the Euphorbiaceae genus, the “Sticks on Fire”, is thought to be one of the most dangerous when it comes to exposure. Eye Contact – Pain, Swelling, Redness, Ulceration, Temporary or permanent blindness. Skin Contact – (there can be a delay in symptoms) Burning, Blisters, Rash, Irritation, all accompanied by pain. Ingestion – Stomach pain, Vomiting, Nausea, Diarrhea. The “Sticks on Fire “is also commonly known by the following names. Milkbush, Pencil Cactus, Finger Cactus, Rubber Euphorbia and Indian Spurge Tree. If you suspect your dog may have ingested, or come in contact with, this plant contact your vet immediately.